Today I followed some of the waterways of Asaka Canal in Koriyama, which was developed by the first national restoration project in Meiji Period and completed in 1882. 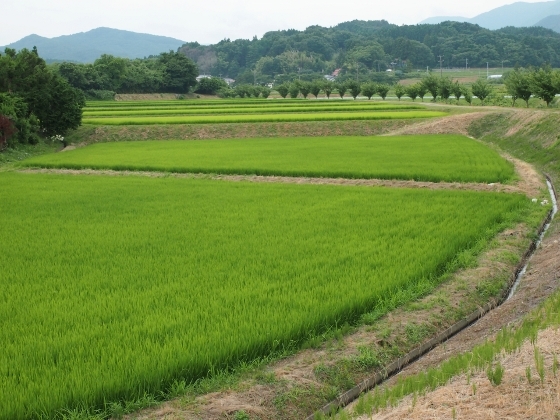 This greatly contributed to the current rich production of excellent rice in this area as well as to the total development of Koriyama area. Asaka Canal was designated as a Japan Heritage. 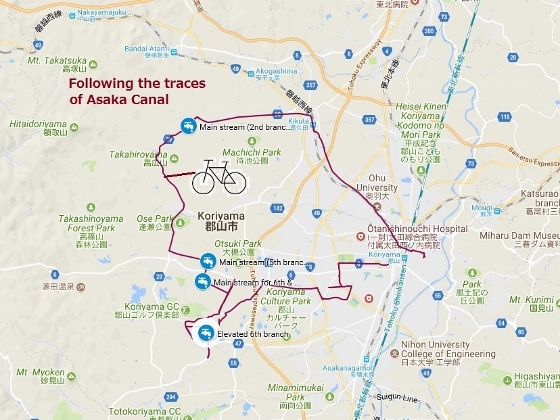 I pedaled my bike mainly through Osemachi, Otsukimachi and Mihotamachi districts, where rice fields have grown to rich green in this time of year at everywhere around. 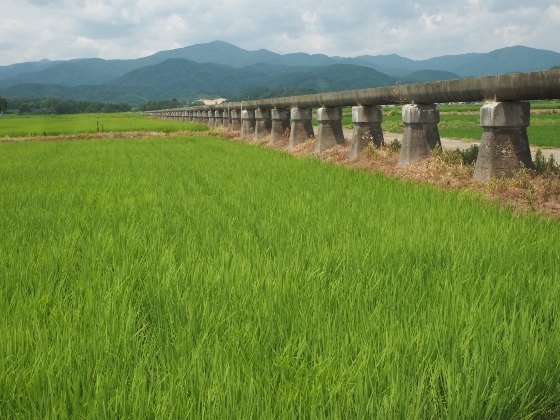 Photo above shows vast rich green rice fields alongside a long elevated 6th branch channel of Asaka Canal in Mihotamachi. 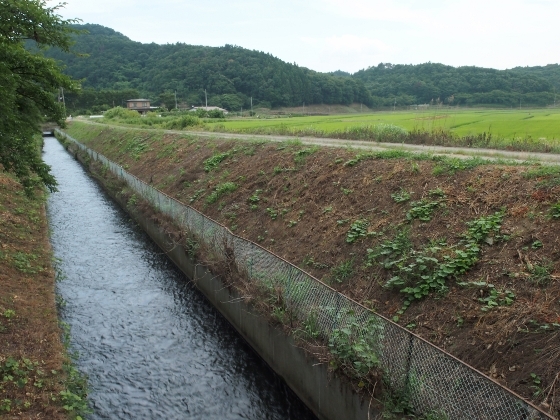 My first stop was Natsuide village of Osemachi in the north, where I could see the main stream of Asaka Canal as shown above near the 2nd branch point. I also found somewhat terraced rice fields grown in rich green as shown above. 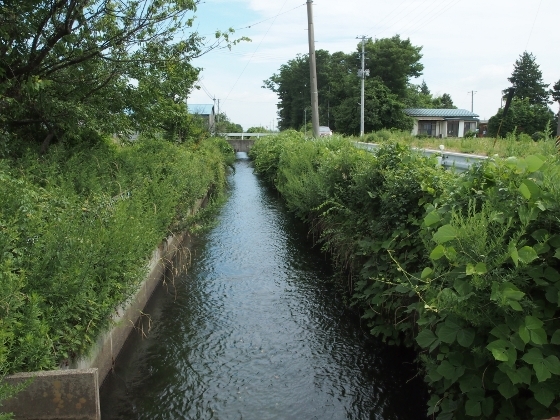 Next stop was Otsukimachi, where I found the main stream of Asaka Canal near the 5th branch point as shown above. 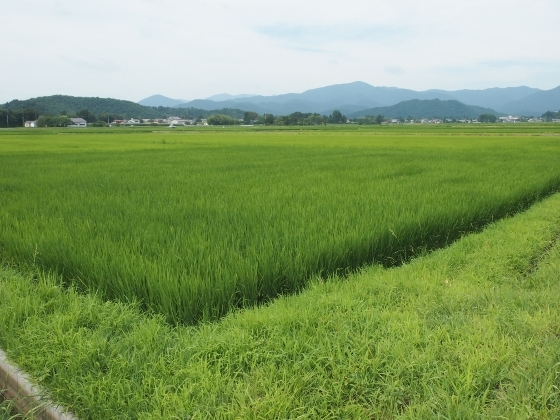 Just adjacent to this point a large rice field extended as shown in the picture above. The main stream flowed toward further south to carry the water for 6th and 7th branch in the south. 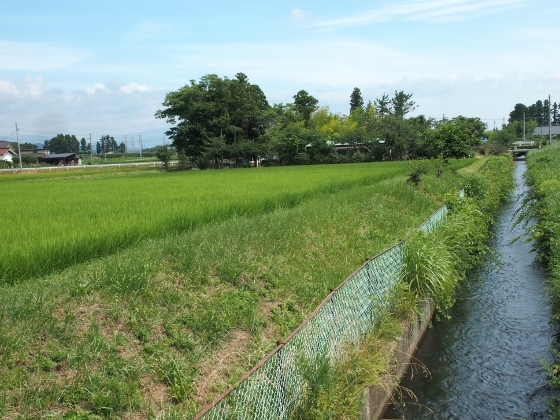 Photo above shows another view of the main stream in Otsukimachi, with a green rice field right next to it. Finally, I came to Mihotamachi area, where I found a long elevated waterway as shown in the top, which was a part of the 6th branch of the canal. I climbed up a ladder and looked into the elevated water channel and confirmed clear water was flowing inside. Today, I walked around the vicinity of JR Koriyama Station and found some of the best autumn scenery in the city center: Hayama Falls and Kinto Memorial Hall. 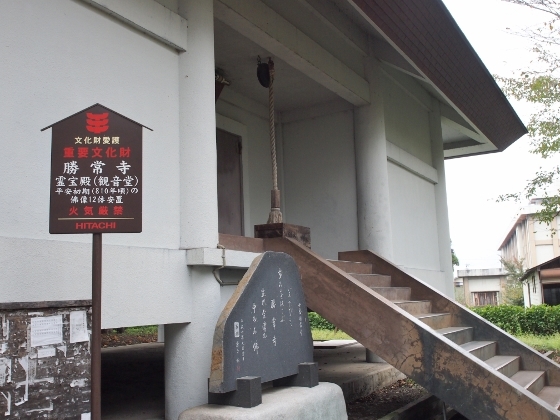 Both of these are part of Japan Heritage “Asaka Development” and are located within 15-minute walk from the station. 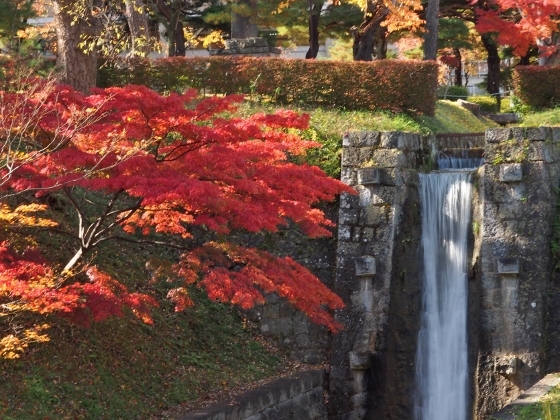 Photo above shows autumn Hayama Falls which was built in 1882 by Asaka Development pioneers. 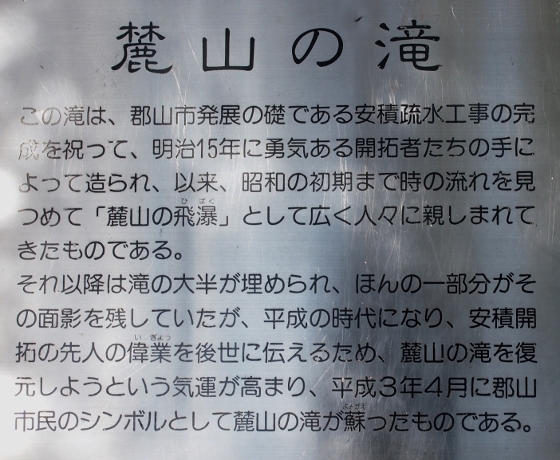 It has long been a commemorative monument for Asaka Canal completion. The water is divided from the main channel of Asaka Canal. A plate above which you can see at the site briefly explains the history. The exact locations are shown in the map below. The map can be scaled up and down with a click and scroll. 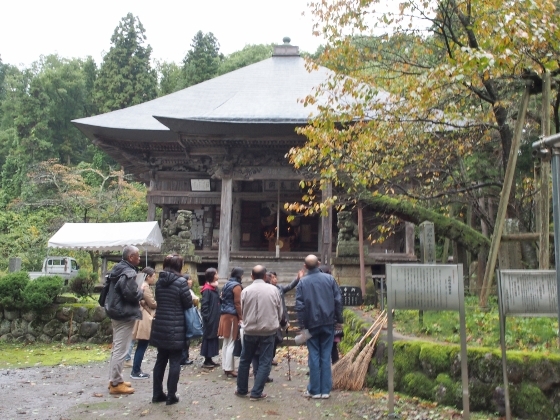 Today, I had a special tour of old Buddist temples in Yugawa Village and Aizumisato Town, both of which are located right west of Aizuwakamatsu. 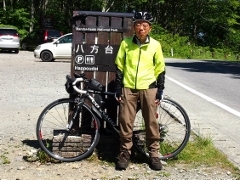 This study tour was organized by Omotenashi_Guide_Fukushima, a group of interpreter guides for Fukushima. I attended the tour as a member. All of us gathered at Michinoeki (or Roadside Station) Aizu, which is about 30-minute ride on local Aizu Bus from Aizuwakamatsu Station. Then we traveled through the route by car. 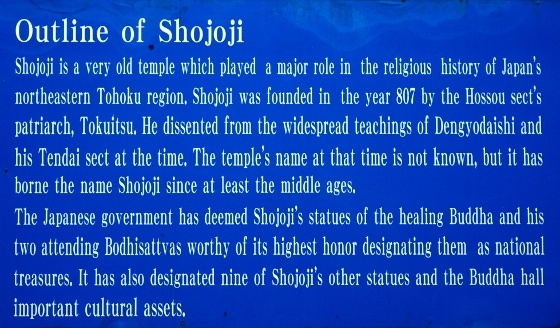 First, we visited Shojoji Temple in Yugawa Village which is only 5-minute by car (or 15-minute by walk) from there. A photo above shows the main Yakushido Hall building which was rebuilt in 1398. 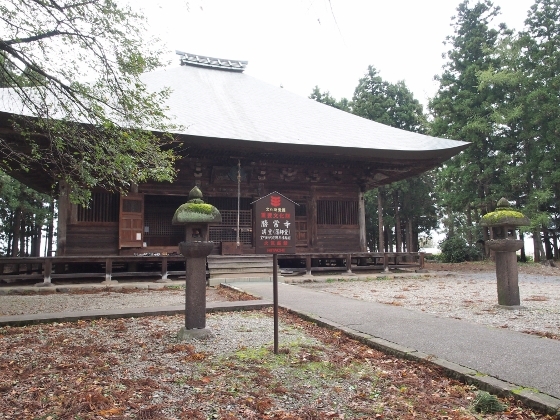 The temple itself was founded in 807 by Buddhist patriarch Tokuitsu. There was something special with this temple. 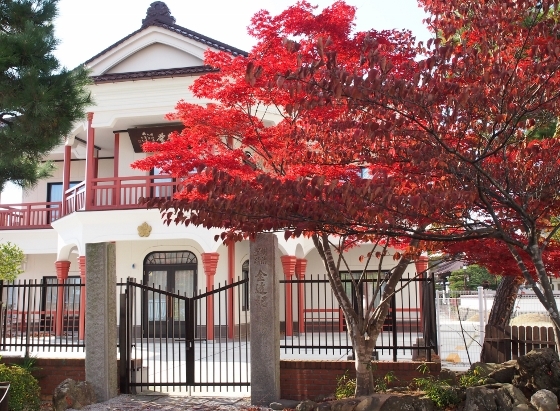 It had a number of treasures including three National Treasure statues and nine other statues designated as National Important Cultural Assets, and Yakushido building which was also a National Important Cultural Asset. All the wooden statues were built in early 800’s. Photo above shows Kannondo Hall building in the precinct, which keeps all of the important treasures. One of them is eleven-faced Kannon statue which is a National Important Cultural Asset and also one (10th) of Aizu 33-Kannon designated as Japan Heritage last year. 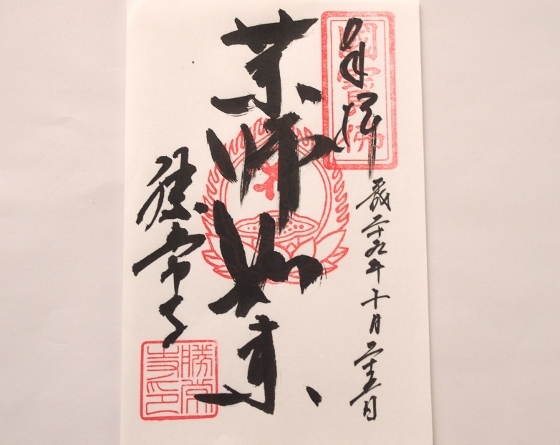 Photo above was a “goshuin” or official red stamp of the temple which was hand-written by the chief priest in person today. Photo above shows a brief English outline panel which stood inside the precinct. An American artist Langdon Warner is said to have contributed to protect these treasures from war attacks. 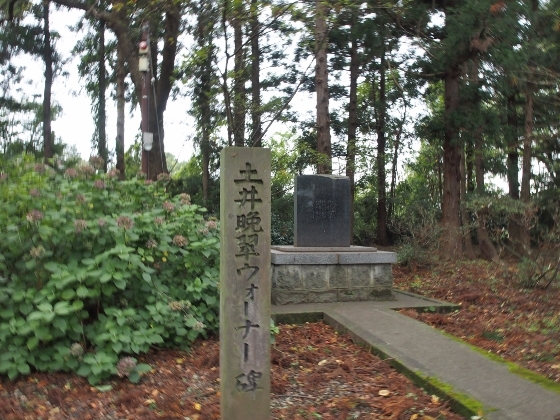 There was a Memorial inscribed with his name (in Japanese Katakana) within the temple ground as shown above. Then we moved to Ryukoji Temple where another National Treasure was kept. 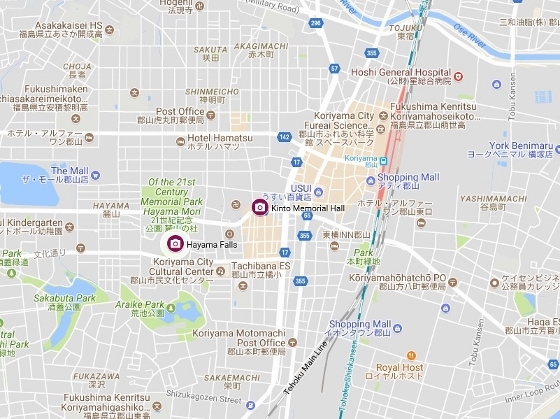 The location is close to JR Aizutakada Station in Aizumisato Town. A photo above shows front garden of the temple with a stone monument of the treasure. The treasure is a set of Lotus Sutra scrolls hand-written in early 800’s. In each of the nine scrolls left today, all of the sutra kanji characters were written on each lotus flower, drawn with different colors. Only a part of the image is shown in the bottom left of the picture above to give an amazing sense of it. Finally, we visited Hoyoji Temple also in Aizumisato Town. 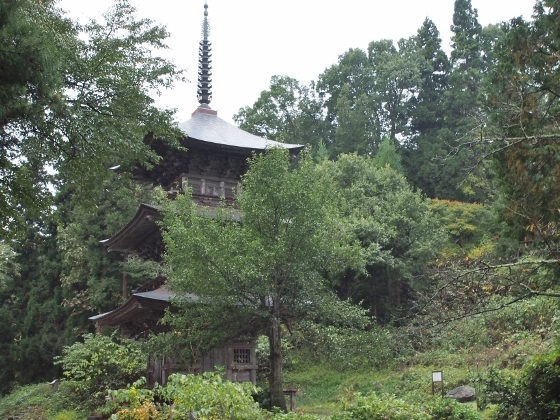 The temple had a 3-story Buddhist tower (23-meter high) as shown above, which was the only kind in Aizu region. It was rebuilt in 1780 for the 3rd time. 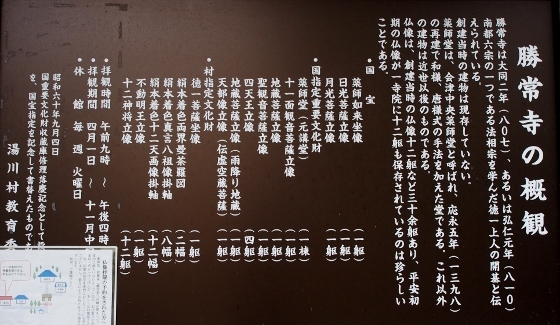 A board above shows a brief outline of the tower in Japanese. 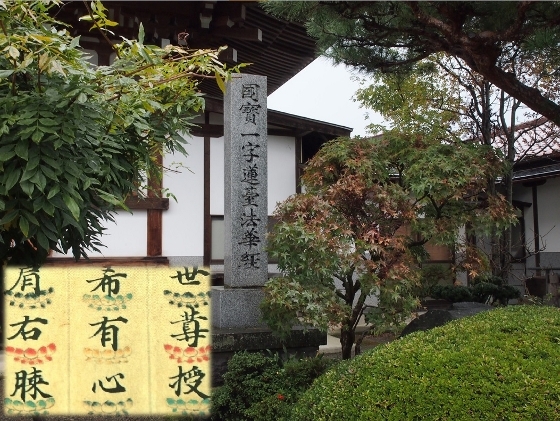 The temple itself was founded in 720 by a Buddhist priest Tokudo. It had a Kannondo Hall called Suzume-bayashi Kannon as shown above, which was rebuilt in 1768. 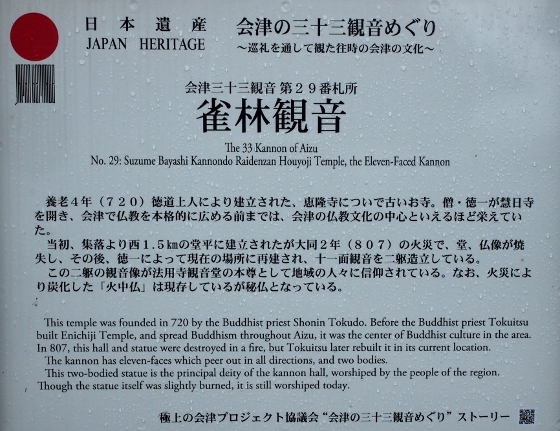 This was also one (29th) of Aizu 33-Kannon designated as Japan Heritage last year. 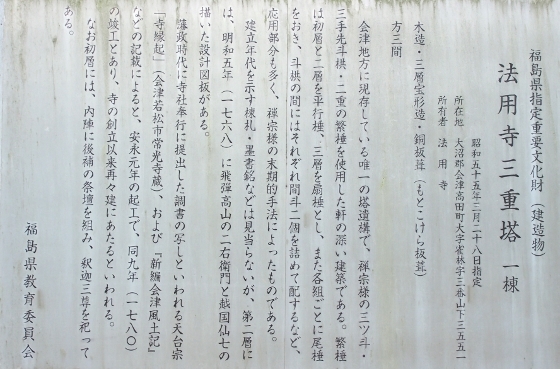 A plate above shows a brief outline of the temple and the Kannondo in English and Japanese. 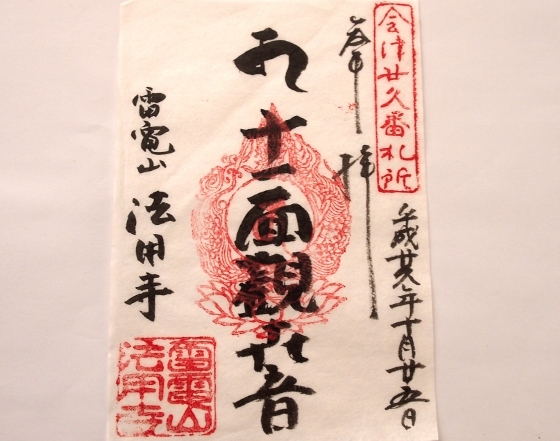 Photo above was a “goshuin” or official red stamp of the temple which was also hand-written by the chief priest in person today.